If you’ve got big Minions fans in the house, they’re sure to love this Despicable Me Advent calendar from Mega Bloks. The advent calendar features 24 different holiday-themed surprises, which you can open and build each day, this exclusive seasonal set includes three never-before-seen buildable Minions in special festive outfits! 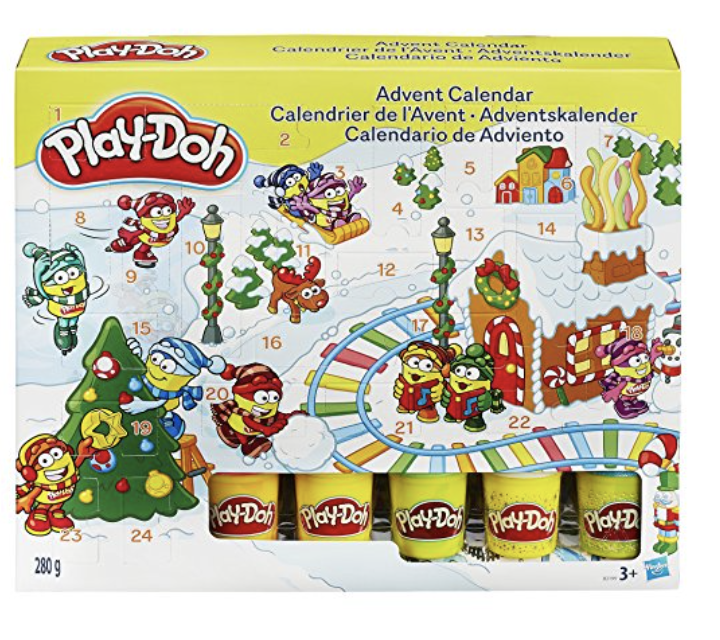 Ideal for ages 5 and up Advent Calendar with 24 different holiday surprises for building a new toy each day. 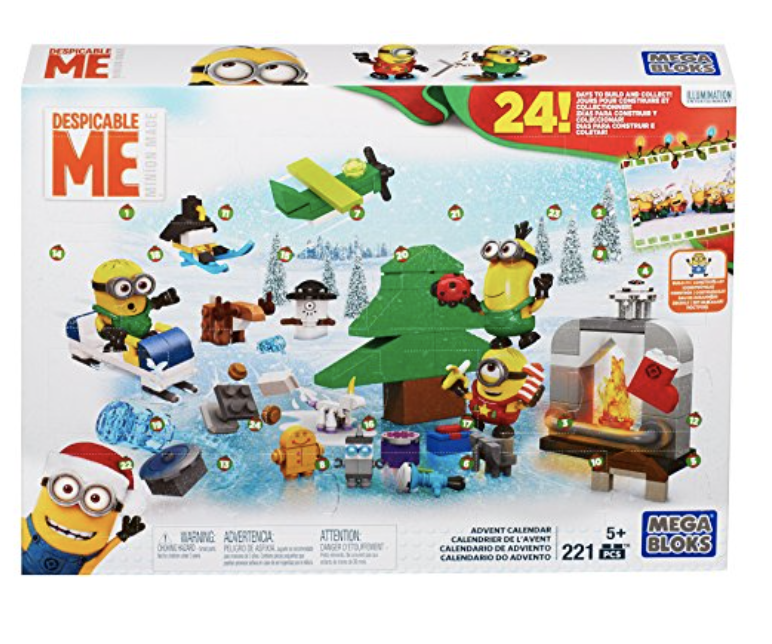 The set includes three never-before-seen, holiday-themed buildable Minion characters with interchangeable parts, including overalls, goggles, arms and feet. If your kids are already into the Mega-Bloks sets, they’ll be thrilled with this. Who doesn’t love Play-doh? This December, they’ve got a cool advent calendar for your kids to grow their collection while counting down to Christmas. With a different surprise gift for each day leading up to the holiday, there’s no knowing what festive creations you’ll be able to shape for the season — and beyond!Includes 24 surprises, playmat, and 5 tubs of Play-Doh Brand Modelling Compound. Get it here on Amazon for £15. Each day in December, your kids will love to discover a LEGO star wars themed minifigure, starship, vehicle or other collectible behind each door. 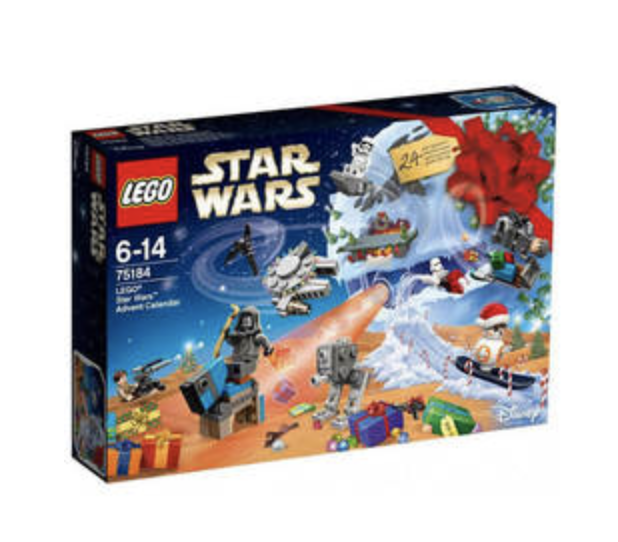 The Star Wars Lego Advent Calendar features 7 minifigures plus a fun holiday-themed figure, Vehicles including the ghost, the phantom, stormtrooper transport, rey’s speeder, millennium falcon, snowspeeder, kylo ren’s command shuttle, y-wing, tie striker, hovertank, at-st, blaster cannon, snow blower and a sled with boosters! Weapons include 3 blaster pistols and 2 blasters. Accessory elements include a wrench and a crowbar. Collect all the gifts and play out your own epic LEGO star wars adventures. It’s available in a few different places including Amazon (£28), Argos (€32) and Smyths (€30). 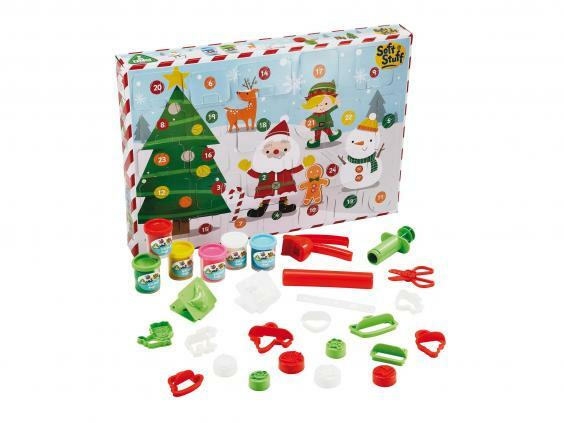 For the littler kids who want to get in on the advent calendar action, V-Tech Toot Toot have a lovely set which will put a smile on their faces. 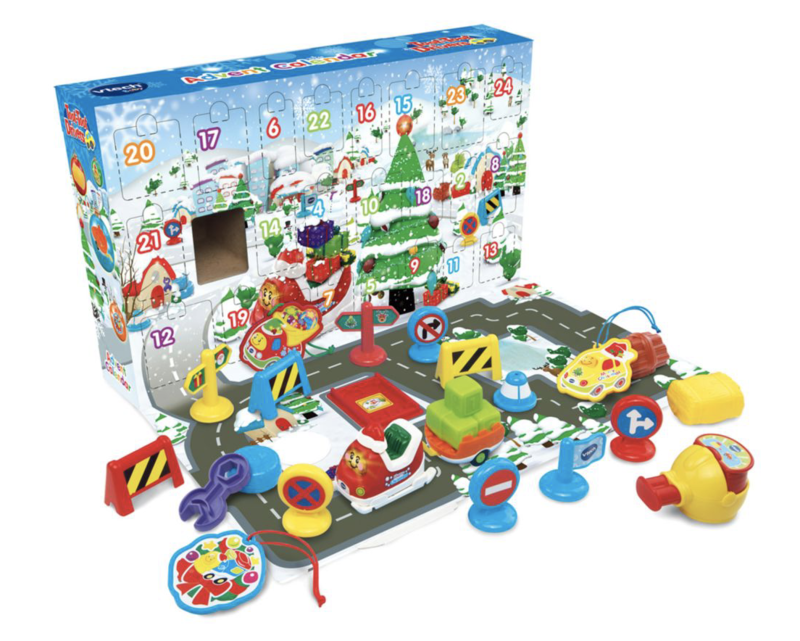 It features 24 fun play pieces including a cute, interactive Toot-Toot Drivers Train, detachable trailer with SmartPoint location, Christmas decorations, signs and loads more mini surprises. The box panel folds down to become a Toot-Toot Drivers railway so you can create your very own Toot-Toot Christmas town. Toot-Toot Drivers Train includes 3 Christmas songs, 6 fun, festive melodies and lots of fun sound effects. The Train responds to SmartPoint locations with different phrases, sound effects and more on all your favourite Toot-Toot Drivers play sets (if you’ve got those already or if Santa is planning to bring them). Available as part of the Boots 3 for 2 offer for €33, or over on Amazon for £18.75. Got any stationery loving kids in the house? 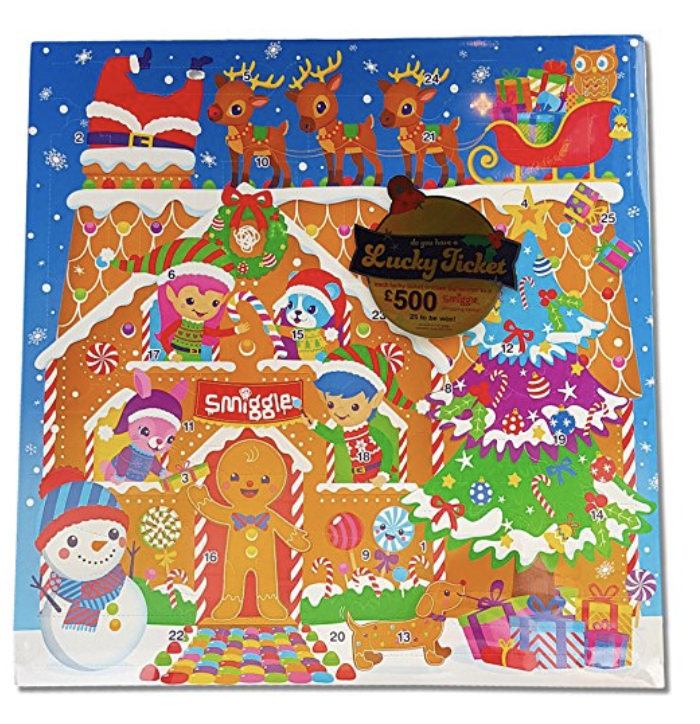 Then this Smiggle Advent Calendar will go down well! This year it includes 25 days of limited edition Smiggle stationery surprises. As well as daily surprises, you also have a chance of finding 1 of 25 lucky tickets inside to win a HUGE £500 shopping spree! It’s available on their website for £25, containing £40 of Smiggle stationery treats. While the website doesn’t specify the contents, I’ve come across reviews which do, for parents to check out the value inside. The Mothercare Happy Land is a really popular brand with small kids, and with good reason. The toys are good quality and really do inspire the imaginations of the little folks in your house. This year, MotherCare have two advent calendars (this one and the one below). 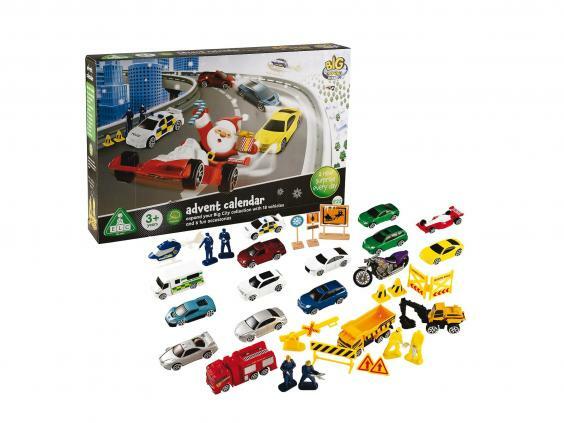 The Happy Land Big City Advent Calendar is perfect for car-mad kids. On each day of December, open up the numbered doors to find a fantastic Big City toy inside. What do you think it will be…a helicopter or a cool fire engine perhaps? Great for pretend play, little ones will love adding to their Big City collection each day and be ready for racing, chasing fun! It’s also a bargain at the moment at €28, down from €40 over on the Mothercare website. If you liked the look of the Playdough calendar, this one may well be up your street. If your kids are big into make and do, this will make them smile this December. There are surprises behind each of the 24 numbered advent calendar windows. Is it a tub of soft stuff dough, a tool to help you model, or an accessory for your soft stuff creation? 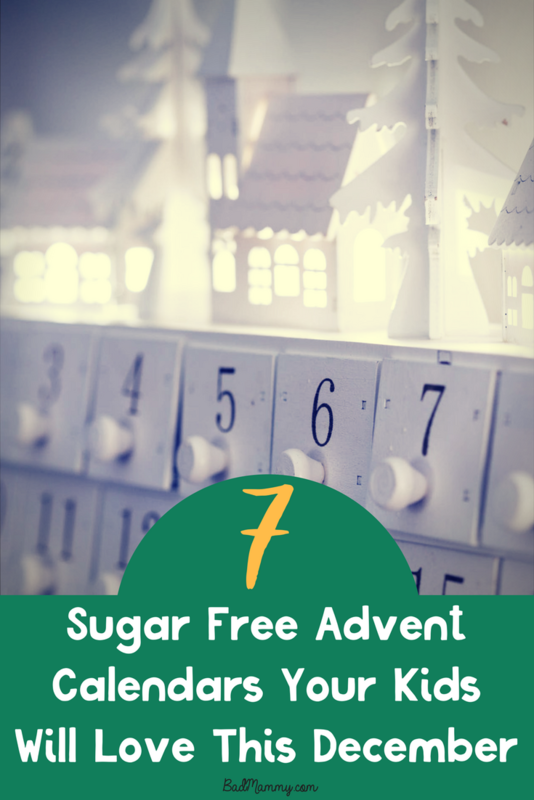 With six tubs of dough and 18 accessories included, this fun advent calendar is great for getting creative on the exciting build up to Christmas. Children will love to squish, squash, stamp, mould and roll the dough creating models as their collection grows. It’s also down to €14 from €28 on the Mothercare Website so get it while stocks last. 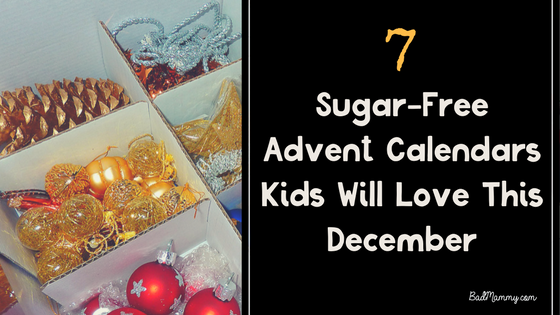 So, there we have it – 7 sugar free advent calendars for your little ones this December. Which one will you choose? Have I missed out on any big ones? Let me know in the comments, comment on Facebook or drop me a line on Twitter!